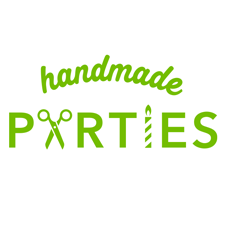 Halloween is THE time to create the most elaborate, extravagant, exciting, or even ridiculous masterpieces in our craft rooms! With three young girls in my house, I don’t think a year has gone by that at least one of them hasn’t worn a tutu of some sort! Hi there friends, it’s Stef from Girl. Inspired. and I’m excited to show you today how to get going on a simple, but stunning costume! 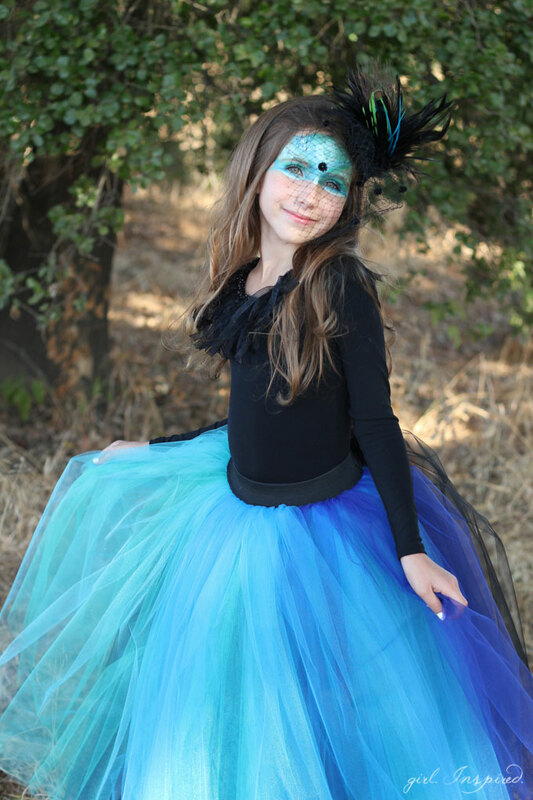 Tutus are so versatile – from princess to bumblebee, all you have to do is select the appropriate color of tulle for your costume! 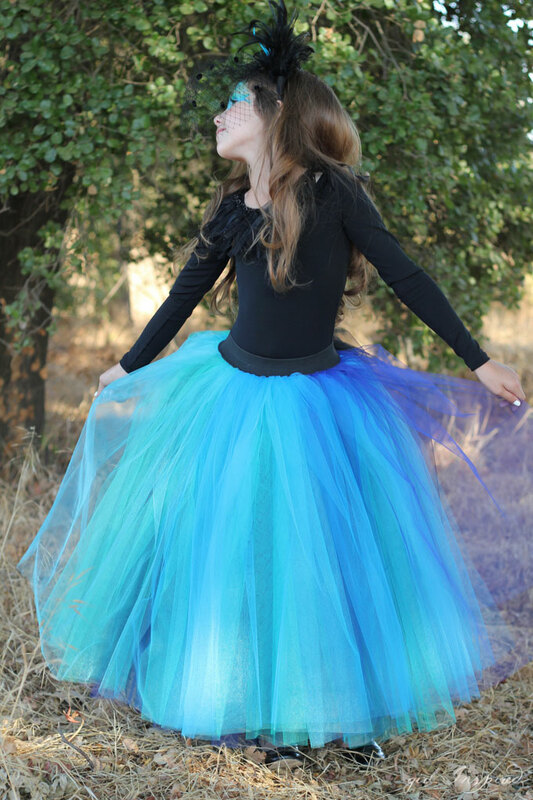 I love the ease of pairing a tutu with a leotard and tights or leggings and then adding a few accessories. 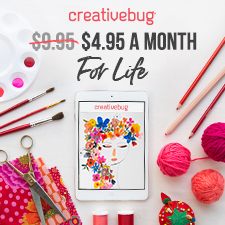 This gives you the opportunity to adjust the costume for the weather and it also cuts back on the number of pieces that you actually need to sew or purchase. 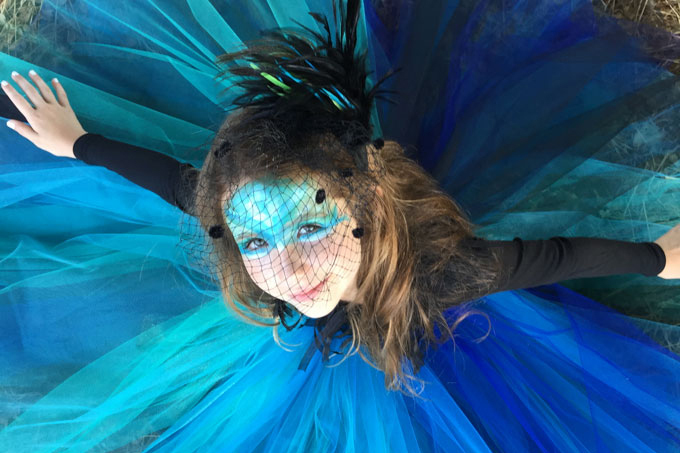 The winning color palette for our Peacock Costume is five blue shades ranging from aqua to black. By rotating five shades of color and stacking the spectrum into five layers, I created a dramatic skirt that is perfect for peacock drama! Step 1: Begin by measuring your child’s waist and the desired length of the tutu – for example, I measured from the waist to the ankle for a long, dramatic tutu. Make a note of the waist measurement and set that aside. 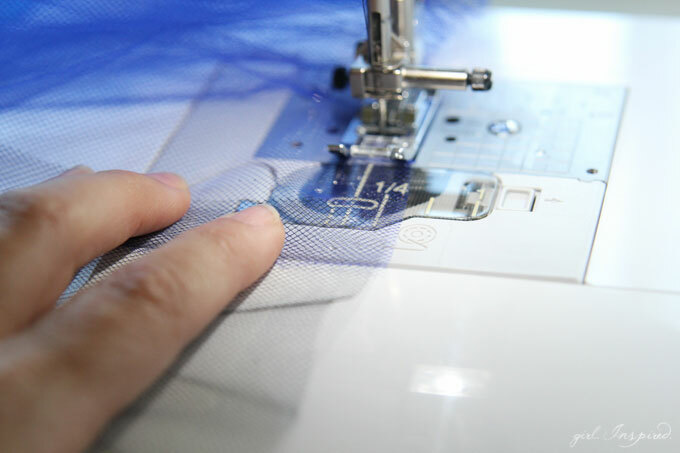 We will begin by cutting the tulle into sections according to the length measurement. 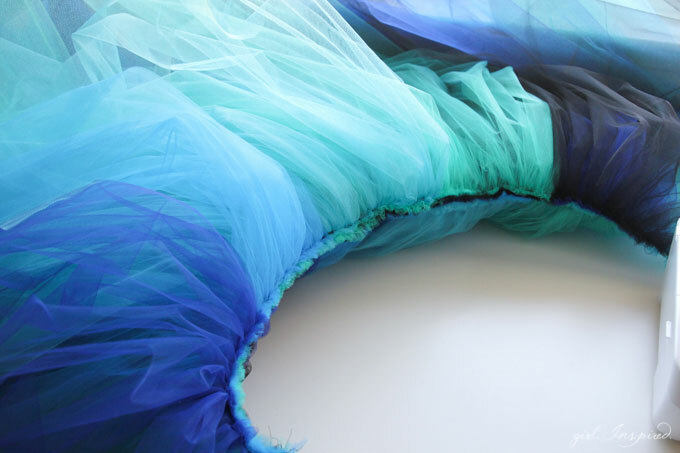 Fold the tulle along it’s width (typically 56″ for tulle). Your yardage will drape off the cutting mat. We need to cut five sections of tulle at the desired length. 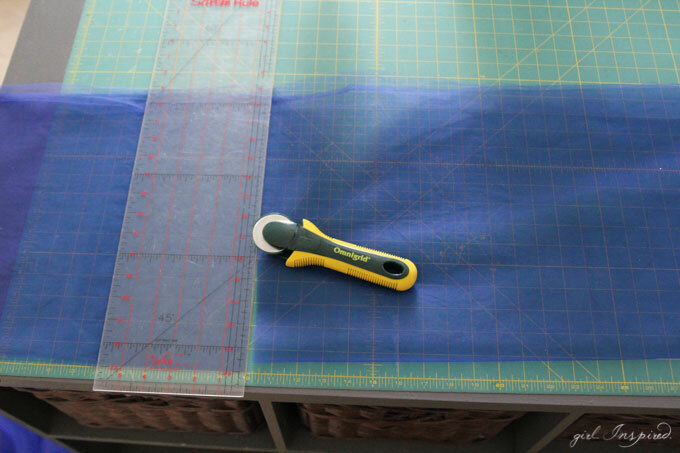 My measurement was 26″ from waist to ankle, so I cut five sections of this cobalt blue tulle to measure 26″ long (and 56″ inches wide). 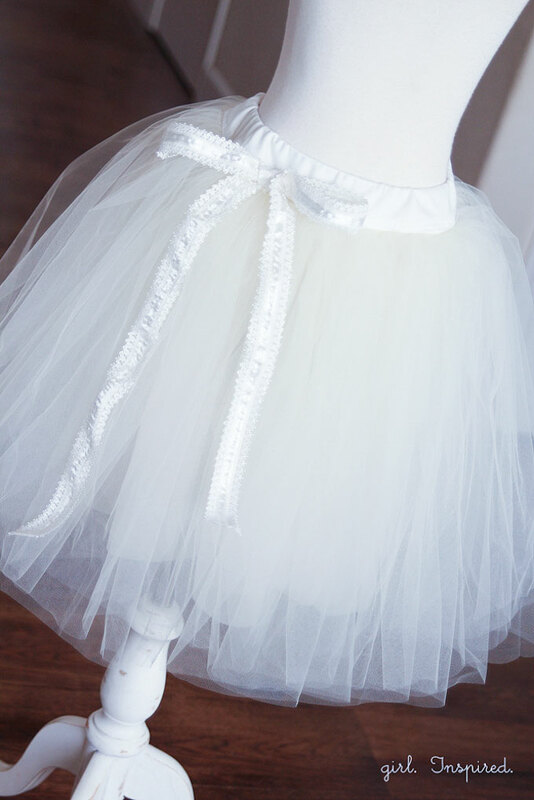 **If you are making a shorter skirt or sewing for a toddler, you will want to measure the length and multiply that by 5 to determine the amount of tulle to purchase. 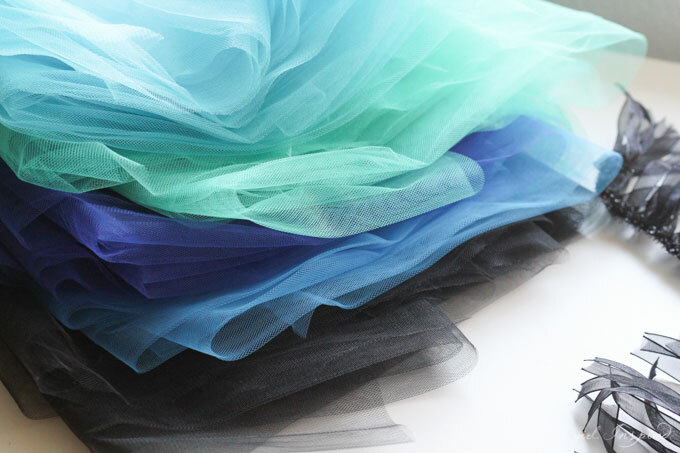 For example, if your desired length of finished skirt was 12″, you would only need (12″ x 5=) 1.75 yards of each color of tulle. 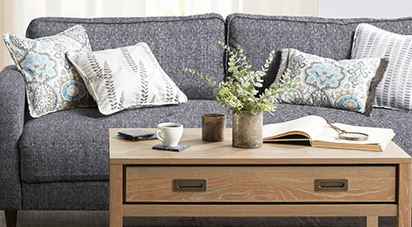 Be sure to add 6″ or so on to your finished yardage to make sure you have a little excess. 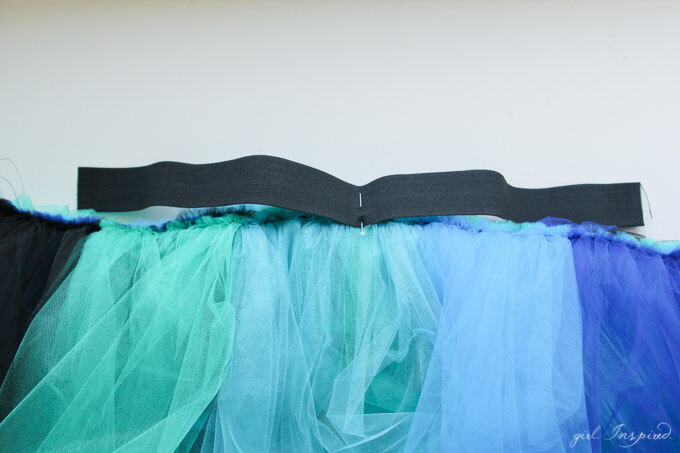 Step 2: Continue to cut your other colors of tulle so that you have 5 pieces for each of the five colors – 25 sections in all. 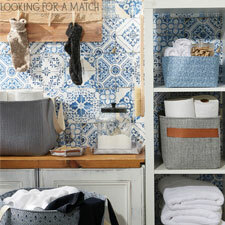 Line them up next to your sewing machine in color/hue/saturation order. Step 3: Now it’s time to gather the tulle sections. 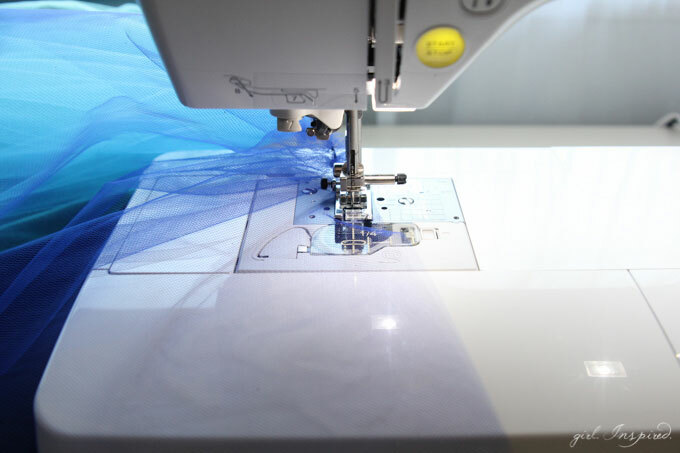 The quickest way to gather the tulle is by letting your sewing machine do the work for you. Using your regular presser foot, adjust the sewing machine settings so that you are using the longest stitch length and the highest tension. With these adjusted settings, you simply feed the tulle through and the machine gathers it for you. Also, since it’s stitching on tulle, you will be able to adjust the gathers later even though you’re tension is set high. 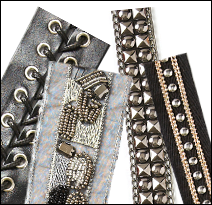 Be sure to leave about 7″ of thread hanging at the beginning and end of each sewn layer so you can adjust the gathers later. 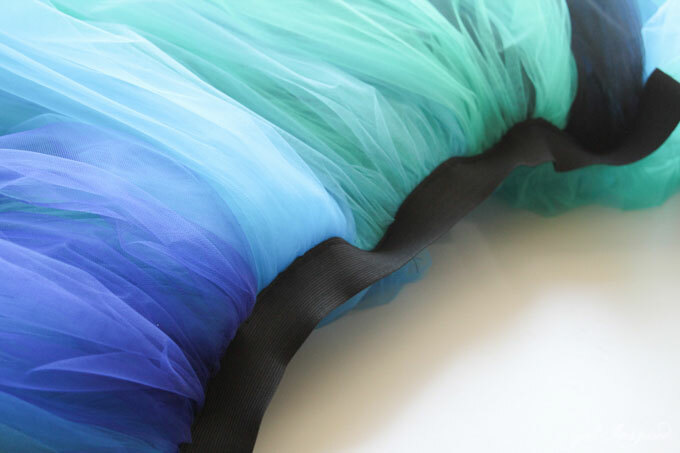 Begin with the lightest shade of tulle (I started with the aqua as seen two pictures above) and stitch along the long edge of the tulle (the side measuring 56″). The machine should gather this section and when it is gathered, it should measure around 5-7″. That’s a lot of gathering, right?! 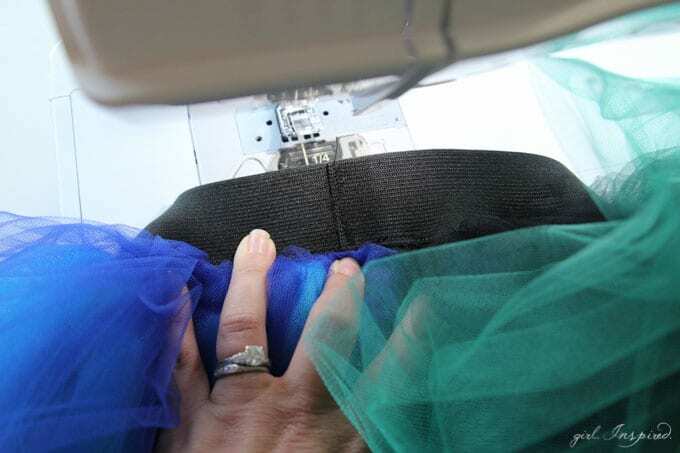 Stop when you have just about 1″ of tulle left to gather and keep your needle down in the tulle. 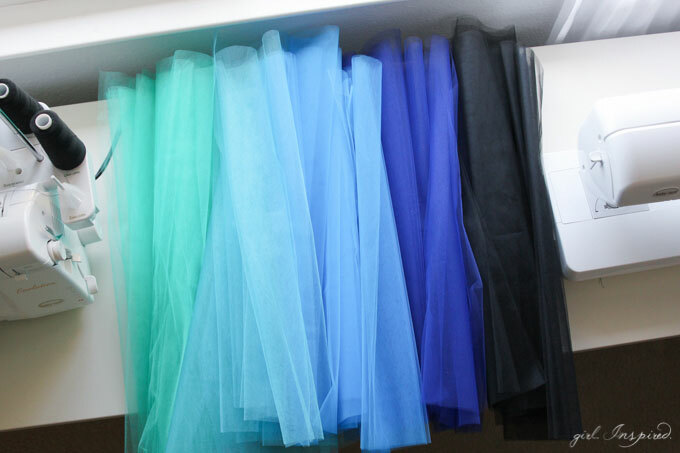 Step 4: Pick up your next shade of tulle. 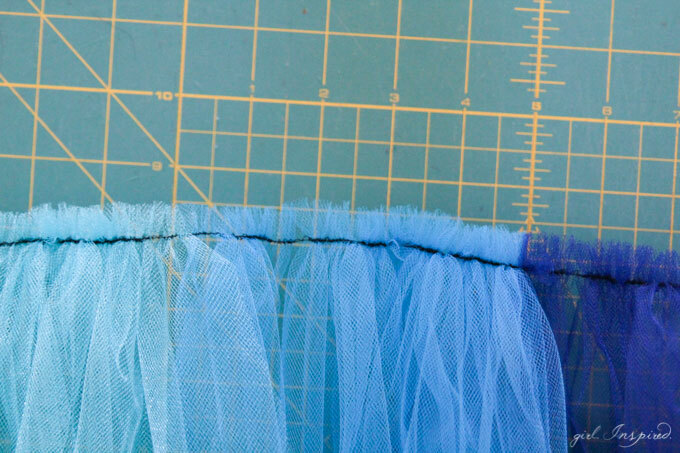 Place the new piece of tulle to overlap the previous piece by 1/2-1″, as shown. Use your fingers to guide the tulle under the presser foot and continue gathering until you get within 1″ of the next end. 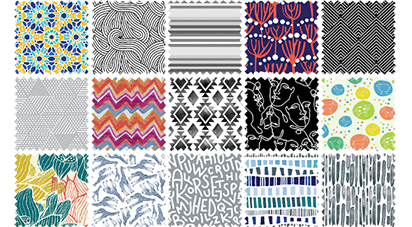 You will notice that by overlapping the ends, the machine continues gathering the fabric seamlessly. 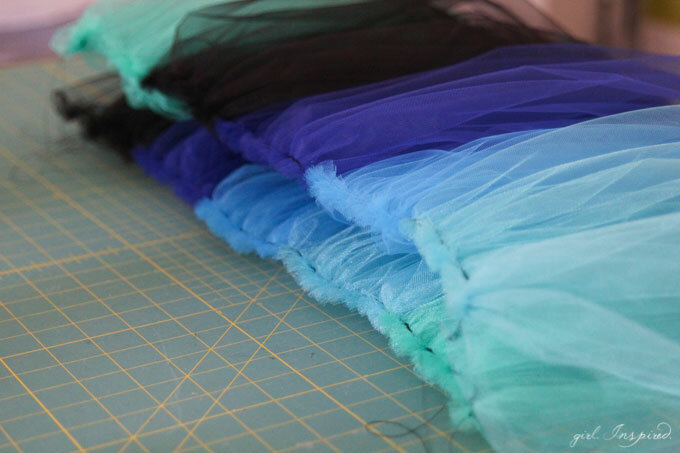 Step 5: Continue with subsequent shades of tulle until you have five pieces gathered together. 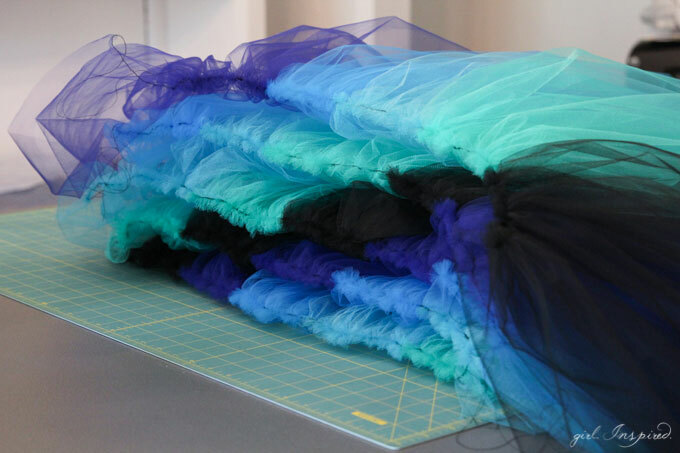 Step 7: Once you have all five layers of tulle stacked on top of one another, you can see how the colors shift down one for each layer. Step 8: When you have all five layers gathered, it’s time to adjust the gathers for the waist measurement. Take the waist measurement of your child and add 5″. 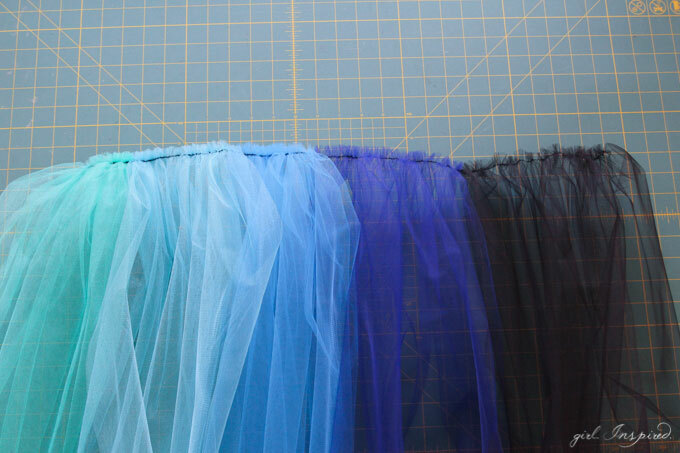 Now divide that new measurement by 5 (for the 5 colors of tulle) to determine how wide each gathered section should be. So, my waist measurement was 20″, I added 5″, divided by 5 and found that each of my gathered colors should be 5″ wide each for a total skirt width of 25″. Pull the bobbin threads gently and shift the gathers to adjust the section widths and make the layer the correct overall width. Adjust all 5 skirt layers so they are uniform in width. Step 9: Time to sew the layers together!! You probably won’t be able to sew all five layers of skirt together at once, but you may be able to do 3 layers and then 2 layers and then sew those together. Using these clips to hold the tulle together is helpful in the tulle wresting game! 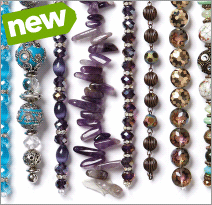 Match the raw edges the best you can and sew them together using a regular stitch length and tension. Step 10: Pat yourself on the back once you’ve wrestled all five layers into a neatly sewn strip. 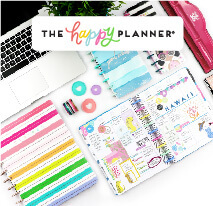 You’re almost done! Step 11: Time to sew on the elastic waistband. Cut a section of black elastic to the exact length of your child’s waist measurement. 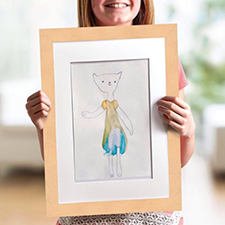 This should be 5″ shorter than the prepared skirt. Match the center of the elastic to the center of the skirt and pin it so that the elastic is on top of the skirt, with the raw edge of the tulle coming up behind the elastic no more than halfway. 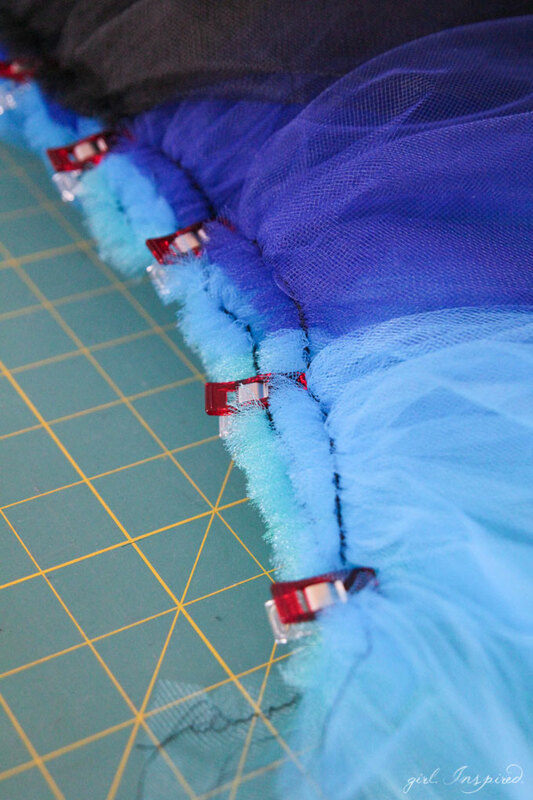 Step 12: Sew the elastic waistband onto the tulle skirt using a wide zigzag stitch. 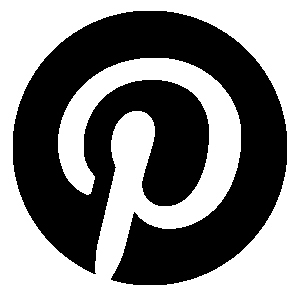 Stretch the elastic as you sew so that the end of the elastic extends about 1/4″ past the end of the skirt, on each end. I found it easiest to sew out from the middle where I had pinned the elastic, stretching as I sewed. Also, be sure that you’re catching the tulle underneath with your stitches and that the raw edge of the tulle remains about midway up the back of the elastic. Step 13: Finally, overlap the raw ends of elastic waistband and stitch them together using a zigzag stitch. DONE!!! 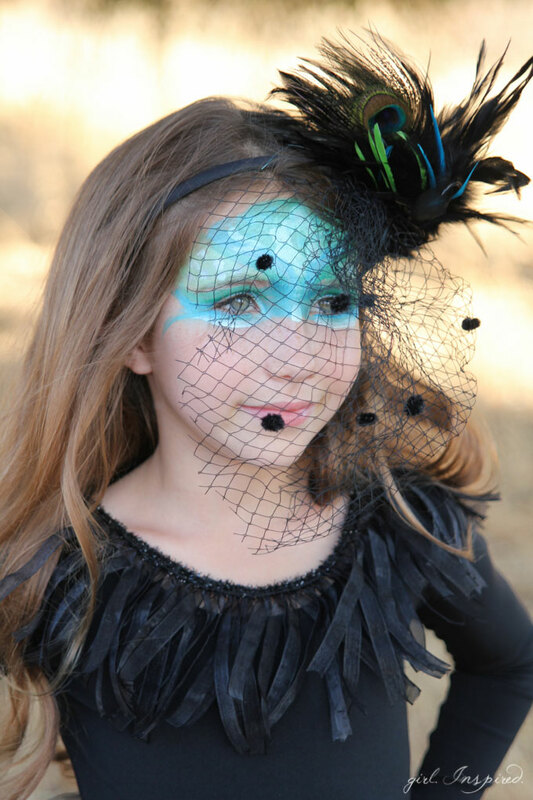 Use accessories and makeup to get your little peacock ready for trick ‘o’ treating! I added this feather fringe trim around the neckline of the leotard with just a few quick basting stitches. That way, it looks festive for Halloween, but I can take it right off when it’s time to head to dance class! 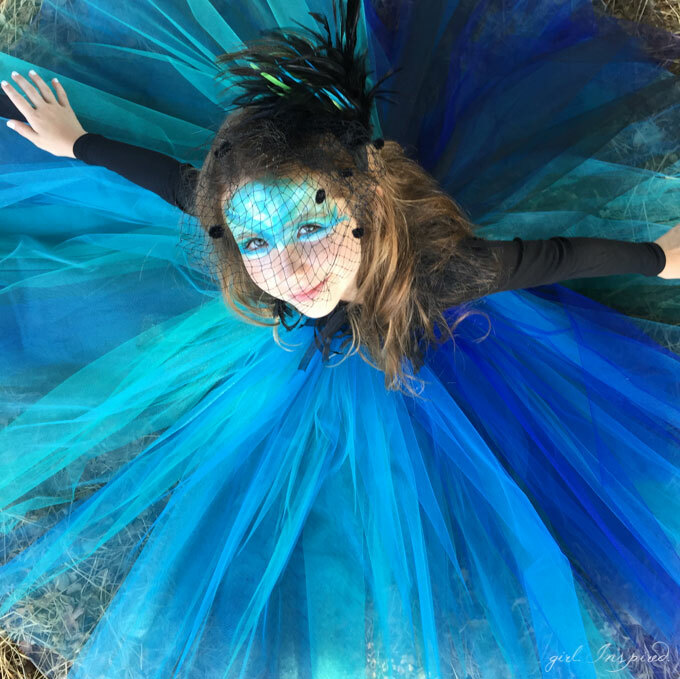 Also, I’m definitely not a face painter, but we had fun trying out some shimmery blues to accompany the peacock theme and I’m pretty pleased with how well it turned out! After I’ve spent a couple hours wrestling tulle, it is so nice to find a few ready-made accessories to pair with the ensemble. I loved this Maker’s Peacock Headband to complete the outfit. Last year, there were lots of Elsa and Anna costumes out collecting treats! 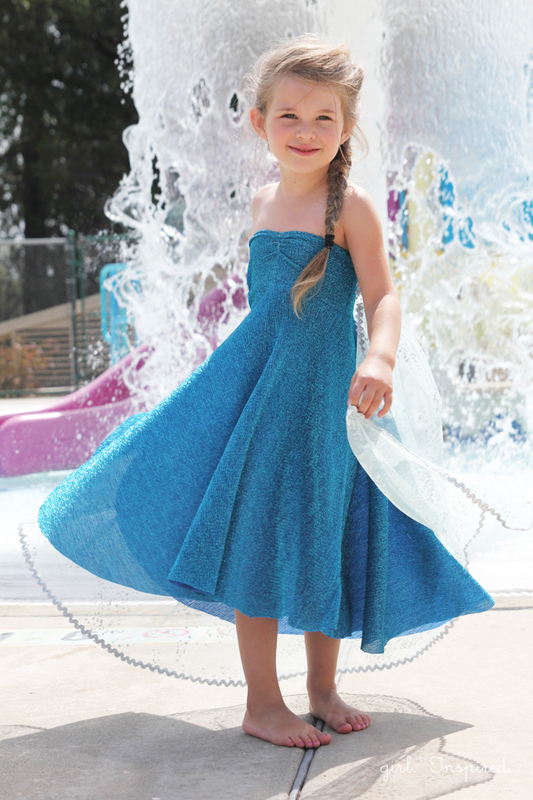 I’m sure there are lots of requests again this year – this Elsa Dress Tutorial comes together quickly and can be paired with a little jacket or long-sleeve shirt for cooler weather! 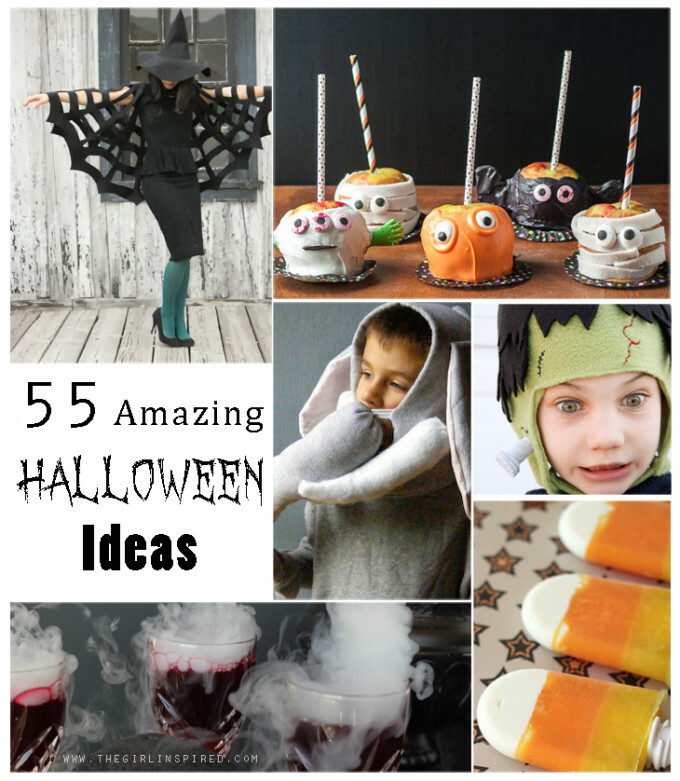 And here are 55 other awesome ideas for Halloween, including costumes and treats! !